"Really like what I hear and CD will fit in nice in my program and will be taken into airplay a.s.a.p." On this, their third disc, they stick with the B-3 tradition of bluesy shuffles (the title track), a few choice funky covers (“Footprints,” “Round Midnight”), and soulful swingers (“Emerald City Turnaround”). With John Dover on trumpet, Bill Harris saxes, Peter Schwimmer on guitar and Kenny Morse on drums, the group creates a big and vibrant sound. It’s perhaps not the cleanest record, maybe a bit too loose, and occasionally the unison horn lines blare through a bit much, but the music calls for the players to be loose and carefree and for that, it’s good fun." "I don't think there is a song on Crescent City Rebirth that I don't like, and I am definitely looking forward to sharing it with my listeners. Please accept my best wishes for great success with it, and thanks again for thinking of me for this!" "I found your "Crescent City Rebirth" when it arrived this morning. Nice Album! I have been playing several tracks as I am writing this. ...Sounds Really Good." "After the Katrina event, Steve Hall was inspired to write his impressions of this devastation. Hall states, "Crescent City Rebirth is an instrumental journey through New Orleans." He clearly went through a period of inspiration from this tragedy, because out of it came thirteen songs. The trumpet and horn work by Hall is soulful and honest on this CD. With songs titled, "Next To The Levee", "The Day Before" and "The Day After", you can close your eyes and put the title to the music quite easily. I love the Hammond B-3, and he plays it effectively throughout this work. The work surely has that feel I might hear strolling the alleyways of New Orleans on a rainy night, hearing the distant sound of a trumpet slightly out of tune - heartfelt." "It's been a pleasure to include "Better Late" in my show, it's a great CD." "On Better Late a quintet of top players from Portland, Oregon, have put together a funky, straight-ahead album, proving again that there is a lot of good jazz being played everywhere in the states...everyone plays flawlessly together and shares improvising time, stretching out with excellent solos." "Many thanks for sending us your album, Better Late - it's a wonderful, straightahead album, now in hot rotation on DR-Jazz/The Danish Music Corporation"
"This group swings like the Flying Wallenda's. The first track was a portent of things to come. Nearing's trumpet led the way with artful comping by Steve Hall on "Better Late" ..Hall's driving solo got right in the mud on this one. "Livin' The Blues" More drive from the five. Some backbeat soul was the goal and they achieved it. "The Dean, Mr. Earl" shuffles along most pleasantly with a fine guitar solo by Schwimmer and a solo by Steve Hall as hot as a bowl of grits. The ensemble is all together and laying on dead red all the way. This is a formidable unit who are not afraid to play and they do it with style. No phony affectation just pure jazz as it was intended. 5 Stars"
"Steve Hall’s debut release on Moovealong Records is a swinging slurring proto-jazz album that boasts smooth Hammond organ and perfected jazz compositions. You’ll find your fingers snapping and toes tapping to the beats and groove. A musician that has seen plenty of action over the years since the mid-sixties strikes out on his own and does a great job." "The Berklee College of Music graduate has assembled a strong quintet here with saxophonist Cal Hudson, brassman Richard Watson, guitarist Peter Schwimmer, and trapster Kenny Morse. In fact, the first three often steal with their solos in several spots throughout the mix of originals and standards. As exhibited by his self-penned salute, "Cap'n Jack Blues", the leader seems notably influenced by the late Hammond giant, Jack McDuff, especially in his arrangements for the combo." "Back up one to "Cap'n Jack Blues" as the song that gets the party really started, and lets bandleader Hall move to center stage where I'd prefer to hear him most of the time." "The self-titled disc is a pleasingly easygoing affair, with Hall's bluesy, swinging sound leading a fine bunch of musicians through varied, if decidedly laid-back, arrangements of post-bop favorites and Hall's decent original tunes." "I liked your CD, as Lisa (Lisa Reedy Promotions) had predicted, and it will be on the show tomorrow. (WUCF-FM Orlando, and again on Sunday, then next Thursday on WFIT-FM Melbourne). The show is "Jazz on the Beach" and I've been at it for 39 years!" "A strong debut from journeyman jazzer Steve Hall and his cohort of performers. Given the band's relative obscurity, the release is surprisingly well put together, with a nice mix of standards and original compositions, and tones ranging from relaxed to uptempo. The standards are treated with perhaps more reverence than one would expect. Really, even more than the originators (especially in the case of Monk and Shorter) might have given their compositions. Hall shines in his solo runs on the Hammond. Certainly worth a spin." "Bop from top to bottom makes this a most welcome album. "Darn That Dream" features Cal Hudson's smoky sax solo along with some cool changes and fine comping by Steve Hall at the organ . This is a super track. Cap'n Jack's Blues..A salute to Brother Jack McDuff and Steve Hall nails this blues number with a soulful solo...Hudson struts along masterfully and Pete Schwimmer is all over the guitar with remarkable facility and the band drives this tune home emphatically. This is an album that swings and then swings some more. 5 Stars." "West Coast vet Steve Hall is "keeping the Hammond organ, hard-bop tradition alive." He does play hard bop with a bassless, organ-led combo - Cal Hudson (saxes), Richard Watson (trumpet), Peter Schwimmer (guitar) and Kenny Morse (drums) - and they're on the ball." 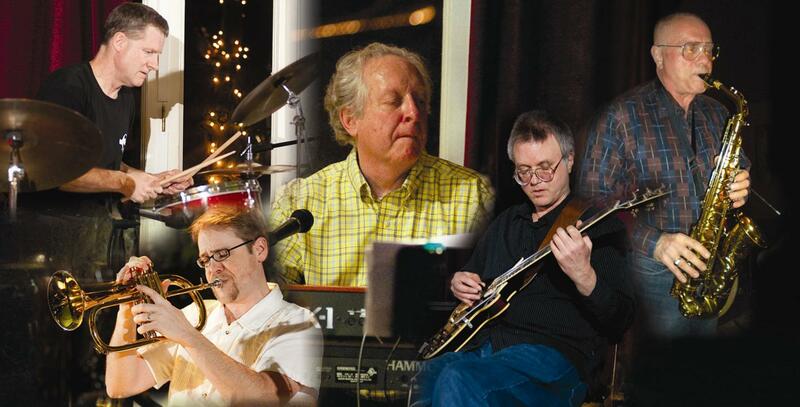 "There is much more to The Steve Hall Quintet than meets the eye. Hall’s quintet is rounded-out by proficient Portland players. Trumpeter and native Texan, Richard Watson studied under Don "Jake" Jacoby, a veteran player with Tommy Dorsey and Les Brown. Pete Schwimmer's guitar-work occasionally belies his other musical pursuit: bluegrass banjo and mandolin. The stellar “What You Say To That?” makes full use of this effect. Saxophonist Cal Hudson does justice to Coltrane’s “Moment’s Notice” with a pronounced, lyrical tone. He turns in a strong solo, then hands-off to Watson and Schwimmer, each exhibiting a proficient bop sensibility. Kenny Morse’s drumbeats propel the others forward, particularly with his imaginative fills and turn-arounds. Seven of these twelve tunes are Hall originals, inspired by the hard-bop likes of Horace Silver, Charles Earland and the Jazz Messengers. The other five are well-loved standards by Thelonius Monk, John Coltrane, DeLange/VanHeusen, Horace Silver himself, and Wayne Shorter. The first track, original “On a Scale of One to Five,” takes right off with standard organ-led hard bop fare. The song format is pretty well-defined, a conscious decision with nostalgic effect. The next original, “Blue Sky and Black Coffee” brings to mind Hall’s Pacific Northwest surroundings. The quintet preserves Thelonious Monk’s unique composed spontaneity on “Monk’s Dream,” and features several brilliant solos. “Rasta Turtle” features a smooth but funky organ timbre, complimented by a nice horn arrangement. Schwimmer’s staccato chord-comping sets up more nice solos. Composers Eddie DeLange and Jimmy Van Heusen's sentimental "Darn that Dream" is often considered the low-point of Miles Davis' Birth of the Cool, but Hall brings it alive in a brand-new musical context, thankfully sans vocal. These five bandmates demonstrate a full dynamic-range and sense of timing, from the groovy ballad “Thursday Strut” to the off-beat blues and reggae infused “Steamy Night Shuffle.” Hall’s organ sounds are pleasing and full-bodied throughout." "Laced with the sounds of Monk, Coltrane, Shorter, and others like it alone would make for an interesting instrumental spin however add the original experiments of a seasoned debut artist and you have captured the interest of many jazz hungry aficionados…Such is the case with the debut offering of the Steve Hall Quintet self released in 2005. Enclosed is a very smooth and cool exhibition of varied sounds that escape from all directions and into the minds of all who choose to accept them. This multi-talented musician has presented a multi-directional jewel case that has caught the interest of the industry. Very much a journeyman but still stands firm on his music principles and the quality he lets escape with his name attached. As one can attest to the sound, arrangements, and composition collectively, they seem to have had a precise and methodical attentiveness associated to them… Mr. Hall has presented a crisp and diverse menu as his debut into studio recording, a very fine piece of work. One cut which has a personality all its own is the blues sound of "Cap'n Jack Blues" as the organ of Hall just accompanies you through the piece. A resonance that seizes the appreciation of the listener and won't let go, a great listen… Also, keep tuned to the string action of Peter Schwimmer whom you may not know but will by the end of this cut… Solo-coated cut "Steamy Night Shuffle" introduces all the members with their own moment in the spotlight, which I find very inventive in many ways. Instrumentals are about all the sounds and in this vehicle; Mr. Hall has accomplished that with technique and a crisp cool arrangement. Detect the brass of Richard Watson as he exhibits a smooth intro with an exquisite outro to the strings of Schwimmer, suitably done. Mr. Hall has been many places on many stages along with his quintet however it is due time he stood alone with band in hand. With this self-labeled offering, he has birthed a new dimension in his career and I hope that the next level he takes is even more a compliment to his craft than this fine piece." "Of the familiar tunes, none would be associated with the organ trio concept, but the quintet gives them fresh treatments: Thelonious Monk's “Monk's Dream,” with Hall's organ rounding off some of the characteristic percussive bump of the tune and sweetening the mix, with a tangy soprano sax solo--a la Steve Lacy-- thrown in to sweeten it a bit more; and Jimmy Van Heusen's “Darn That Dream,” Horace Silver's “Silver's Seranade,” and Wayne Shorter's “Witch Hint.” Coltrane's classic “Moment's Notice,” from the masterful Blue Train, sounds full of joy as it glides forward on a smooth, organ-chilled momentum. Hall also writes a fine tune. The opener, “On a Scale of One to Five,” lifts the spirits--minor key or no--with a fine and lively trumpet solo by Richard Watson, and “Blue Sky Black Coffee” struts along with a spring in its step, showing off Hall's skills with an engaging melody and catchy groove. The group does get a little down and dirty with one blues offering, “Cap'n Jack's Blues,” for Jack McDuff, on a set full of engaging straightahead organ and horn jazz." "Hall is a Hammond B-3 organist in the vein of post-boppers like Charles Earland, Jack McDuff and others, with the ability to swing like Joey DeFrancesco and the soulful vibrato of Jimmy Smith." "This is the kind of more traditional-styled Jazz album the genre is associated with, but making an album sound that good is not easy. Hall and company pull it off. Even if you know Jazz, the move from the originals to the covers are seamless and pleasant throughout, as are the performances and the PCM 2.0 16Bit/44.1kHz Stereo recording."